China's economic landscape has become more complex and challenging since 2018. Against this backdrop, the development of a robust domestic market has been put forward as an important measure when curating macro-regulation, with tax reduction, a policy designed to unlock the huge potential of domestic demand, drawing particular attention. Premier Li Keqiang set out the tasks for the government in 2019 at the Second Session of the 13th National People's Congress on March 5, stressing that a combination of measures will be adopted to foster a stronger domestic market. These include implementing larger-scale tax cuts, significantly reducing enterprise contributions to social insurance schemes, ensuring tax and administrative fee cuts are fully implemented, alleviating the difficulties faced by enterprises in accessing affordable financing, and making effective use of local government bonds. The reduction of taxes and administrative fees will improve the business environment. Enterprises benefiting from an enhanced business environment can reduce the price of their products as their business cost falls, further stimulating consumption. The move could also increase the incentive for enterprises to expand production and seek greater technological innovations. On the other hand, tax cuts are conducive to increasing the disposable income of individual consumers. 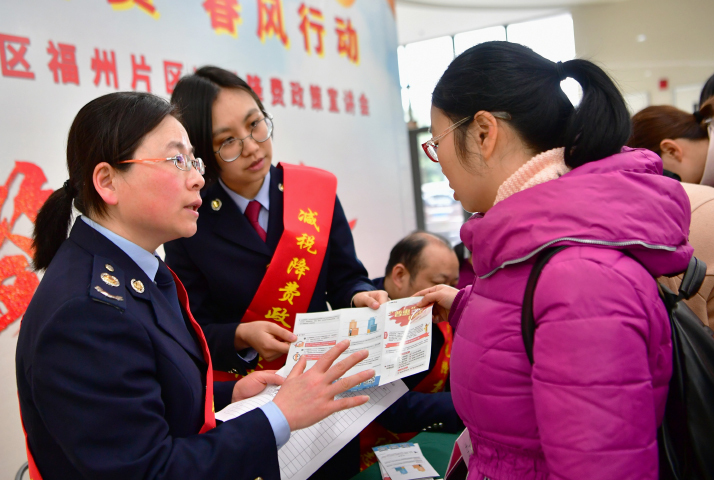 Data released by the National Bureau of Statistics shows that richer Chinese consumers are upgrading their consumption patterns, shifting the focus from making ends meet to pursuing a higher quality of life. This is also consistent with international trends. Whether it is consumption expansion or consumption upgrade, the basic premise lies in income growth. The measures on special additional deductions from taxable personal incomes that took effect on January 1 are equivalent to indirectly increasing household incomes. Several issues should be properly handled when expanding consumption. A proactive fiscal policy and a prudent monetary policy are both essential to enhancing the domestic market. But if the additional funds in society do not flow into the real economy after tax reductions, it will not stimulate consumption. Worse still, if the money instead goes into the capital market, this would lead to the risk of an economic bubble. Inflation risks should be prevented as well. Though the current price level remains low, with a year-on-year increase in the consumer price index (CPI) at 2.1 percent in 2018, many people are concerned about the possible deflationary pressure. Those in the business community believe that the direct result of a proactive fiscal policy and a prudent monetary policy will promote the growth of the CPI. In addition, due to external trade frictions and reforms of social security collection methods, low-end supply risks rapid contraction, which is unfavorable for the stability of prices and the consumer market. The tax and administrative fee cuts should be conducted on the supply and demand sides simultaneously. On the one hand, the threshold of the personal income tax should be raised to directly expand consumer demand; while on the other hand, various taxes and administrative fees for enterprises should be slashed to make lower commodity prices possible. The rate of return on investment of enterprises would increase by reducing taxes, which is conducive to stimulating investment and fostering the domestic market. More attention should be also paid to the increase of government debt. A stringent management and supervision system is badly needed to ensure the stability and security of the financial system.